Trivia Teams Assemble! Final event details are here with details on new venue - Pinnacle! 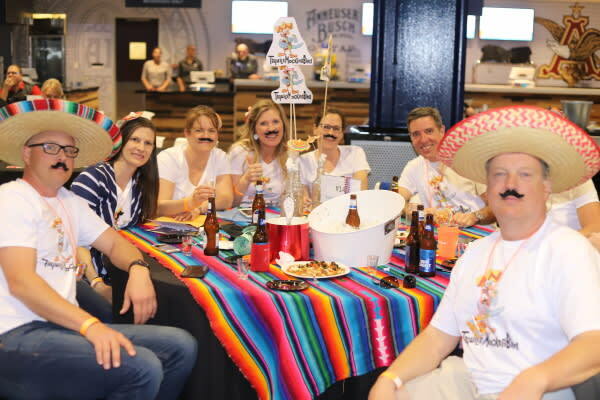 This fun-filled, team-based event puts a unique spin on the traditional game of trivia. Brain Power Happy Hour is RMHC-KC’s newest fundraising event taking place on April 11th at the Pinnacle National Development Center - just down the street from Children’s Mercy Park. Please note this is a change as Sporting KC now has a game on the 11th and so we are relocating the event. Teams of 8-10 can be corporate sponsored, team fundraised or a combination of the two. Teams must raise $1,000 to participate and can receive additional team spots, prizes and team incentives leading up to the event. Get your co-workers, brains, buddies, and family involved because the more you fundraise, the more benefits your team will receive. On April 11th, teams will enjoy complimentary beer, shareable appetizers, yard games, and various forms of entertainment including trivia hosted by the trivia experts, Geeks Who Drink. The highest scoring team will be declared Smarty Pants and receive a team prize! Recognition (and prizes!) will also be given to the Top Fundraising Team, Top Individual Fundraiser, Best Team Spirit, and Last Place Team. All proceeds directly impact the families staying at Ronald McDonald House Charities of Kansas City. By supporting Brain Power Happy Hour – you’ll be helping us provide families with the physical resources they need and the immeasurable things like emotional support while their child receives the medical care they need. The mission of Ronald McDonald House Charities of Kansas City is to reduce the burden of childhood illness on children and their families. We help children heal faster by keeping their families together, and giving these families a place to rest and refresh that feels like home. Helping a sick child fight their illness takes an emotional toll on a family, and adding the financial strain can make it almost too much to bear. We eliminate the expense of finding a close, affordable place to stay for these families in distress. In 2018, RMHC-KC served 7,685 families for an average stay of 6 nights, and served more than 60,000 visitors in the Ronald McDonald Family Room inside Children’s Mercy Hospital who needed a place to relax, refresh and regroup in the intense hospital environment. We rely on donations from the community as well to help with keeping our lights on and our facilities clean and welcoming for families. RMHC-KC relies on the community's help to have home-cooked meals, make families feel welcome and do various services like laundry and maintenance. Last year we were lucky to have 17,500 volunteers from the Kansas City community. Join us by teaming up to keep families together and participate in this year's Brain Power Happy Hour presented by Spire!!! It's sure to be a fun evening of games, food and trivia competition - all in support of RMHC-KC! A look inside Ronald McDonald House Charities of Kansas City and the services they provide families staying together while their children are being treated in local hospitals. The Tequila Mockingbird team posing for a photo at 2018's Brain Power Happy Hour event. The Team won Best Team Spirit!